Over the last few years, drones, sensors and satellites have started to be seen less as gadgets and more as tools for investigative reporting that would be hard to do through traditional newsgathering due to the lack of available data or restricted access to remote areas. At the International Journalism Festival in Italy last week, Chris Roper, ICFJ Knight Fellow and editorial strategist at Code for Africa, moderated a panel about how these technologies have "moved beyond hype" to drive investigative journalism projects in developing countries such as Tanzania, Kenya, Nigeria and India. Justin Arenstein, director of Code for Africa, said drones, satellite imagery and sensors, sometimes even used together, give journalists an "immediate way of getting to a story that is happening out of reach in isolated or difficult to access locations", and the costs of using them are low enough to make them accessible even to smaller newsrooms and freelancers, which wasn't the case before. "With satellites even if you hadn't been actively monitoring something, you can also go back in time and find footage of that place, and send a drone for up-to date-details which provides an immersive look that pulls people into the story. "Events in some areas receive far less attention than others simply because there is no visual material, but using these technologies you can put hard-hitting visual evidence to a story that previously would have been two or three paragraphs and would've been dismissed or not broadcast." 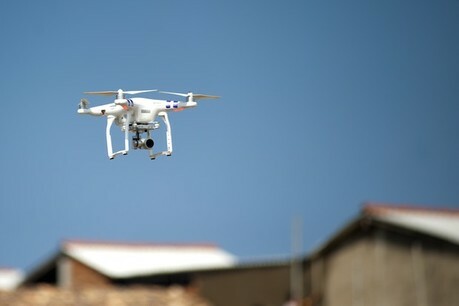 In Africa, a non-profit organisation called africanDRONE was set up 10 months ago to connect local drone pilots around the continent and empower them through a network that offers funding, skills development and resource sharing. The network currently has a presence in 17 of the 54 countries on the continent, and its members have been contracted by organisations such as the Guardian and Thomson Reuters to work on drone storytelling projects including 'Roads to nowhere: How infrastructure built on American inequality' and 'Slumscapes', an in-depth look at five of the world's biggest slums. Arenstein also gave the example of a related initiative in Zanzibar, a region that has been facing issues around sustainable fishing due to the growth in 'blast fishing', where fishermen use explosives to maximise their catch. "We have built a series of hydrophones, which are underwater sensors that triangulate and track where an explosion happens, triggering a drone. It sends out an immediate alert which means a reporting team can be there right away and provide breaking news reportage. It's no longer based on a press release from a conservation NGO. "The hydrophones also generate data, so over time you can start mapping where these explosions take place, which leads to data-driven investigations." In India, both daily newspaper Hindustan Times and small non-profit organisation IndiaSpend have used sensors to monitor air quality and pollution. While the former produced a map that shows users the levels of pollution in their chosen city, the latter partnered with Twitter to develop an API that enabled users to tweet using the hashtag #breathe and the name of a city to receive an instant reply telling them the level of pollution in real-time, explained Nasr ul Hadi, Knight Fellow, International Center for Journalists. Hadi also said the newsrooms he has worked with are more likely to adopt these technologies if they can be used for recurring stories that "will make them relevant to the conversation every time a particular issue comes back", as opposed to investing in them for one-off, larger scale projects. At the African Defence Review, satellite images have been used to combat misinformation following an Al-Shabaab attack on a Kenyan military base. The Kenyan media and the perpetrators portrayed contrasting narratives of the event, citing different numbers of casualties, and the 'before' and 'after' satellite images of the area enabled the organisation to check the authenticity of the claims being made, said Soila Kenya, data journalist at Code for Africa. She also referenced a project that uses sensors to map air quality in Africa, which has been piloted in Kenya, South Africa, Nigeria and Uganda. Hosted on OpenStreetMap, the initiative provides real-time data and makes it available in one place in "a robust form, so that news and civic organisations can do more research and map out the problem", she added. The software and hardware used for the project are based in an office in Nairobi, which makes it accessible to everyone in the organisation, not just a handful of people who are working on it. "Air quality is something you can't see and people don't really think about it as much so it is definitely a good story for newsrooms. Once you provide the data, bring in the journalists, explain how it works and let them interact with the technology, you find they are actually are interested in writing such investigative stories and not just covering the daily news cycle. It's when you make it seem like it's just for tech people that you have that disconnect." Arenstein agreed, pointing out that having people on the editorial side steer these projects alongside the developers can also help "shape the evidence you are looking for and the material you are collecting" for stories. Another incentive for getting journalists to experiment with these technologies is to explain that the goal is not to use sensors or drones to "complicate their reporting" by doing something that can be achieved in traditional ways. "Once newsrooms understands that, it becomes something that gives them an edge and the tone of the story changes. It's no longer about how pretty it makes the project, it's about the fact that it's the only way to tell the story. We should be using these technologies for utility-focused challenges, otherwise they become frivolous to some extent," he added. The panelists also agreed that an important aspect for newsrooms is to consider how they can build an audience around these projects as well as how to monetise them. For example, a publication can sell premium advertising and subscriptions around these projects, or build data stores to sell the information to other organisations, in the way ProPublica is doing in the US. "We need to start thinking about more than just one-offs, so longtail projects that are either recurring or that create a new audience or information service for a media partner," Arenstein said. "Because these projects are usually planned by journalists, they just build something beautiful and put it out there, but we need to start thinking about more than just one-offs – longtail projects that are either recurring or that create a new audience or information service, and that's something we are pushing with a lot of our partners at the moment."